For a millennia and more, music has been used to convey a story. From the Greek and Roman amphitheaters to medieval fields and courts to modern opera and symphony halls, tales of adventure, passion, and grandeur have been set to music and performed before a receptive audience. It's also no wonder, that in our recent history, that heavy metal, prog rock and prog metal have been used to tell great tales of science fiction and fantasy. It just fits: the medium is perfect for displaying marvelous and epic stories. It's also an answer to one science fiction and fantasy writer's dream. As a complete musical concept, 'Terra Incognita' is nothing short of brilliant. Beyond the creative arrangements and expert musicianship, the most remarkable element of this album is how both of these characteristics work to convey the mood present in the lyrics. For example, on 'Call Of The Sea' the music displays the passion for adventure of Criston and the submission to and pain of separation for his wife, Adrea. 'Letters In A Bottle' brings the somberness of cello and violin to explore Criston's memory, love and desire for Adrea while at sea. Conversely for Adrea, the masterful and melancholy symphonic prog of 'Halfway' reveals the division in her heart as the mundane details of daily life crash into her longing for her husband. This conviction to set lyrical mood to music also has some unexpected results as on 'Anchored,' a song about Soldan-Shah's prelude to war. One could expect a near bombastic arrangement to convey the expectation of war. Rather, the lyrics suggest a quiet confidence born of faith, and so the music reflects this. Symphonic elements and piano are balanced against heavy riffed melodic rock to convey both calm resolve and impending battle. Another notable arrangement of this type comes on the instrumental 'The Sinking Of The Luminara' where the ship is destroyed by a great sea monster. Again, one would expect a tour-de-force of strong aggressive music, possibly near deafening power metal. But the composition sways (as any sea battle against a Leviathan might) between fearful calm, deliberate action, and then final defeat and loss. Certain kudos should go to the sterling vocal performances of LaBrie, Stadler, Lane and Payne as all participants articulate the color and mood of the story quite well. Also, Norlander's compositions are altogether inspired and lavish. Alternatively, these two things plus a third give cause for some consternation. Often the vocal performances were submerged under the weight of the instrumentation as on 'The Call Of The Sea,' for example. Additionally, some of this weight comes from Norlander's free, abundant and often overwhelming keyboard work which forms the foundation for a great majority of the songs. Finally, pay careful attention to your copy of 'Terra Incognita' because mine had typographical errors regarding the song order which led to some minor confusion. 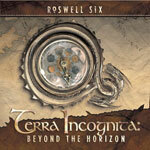 Overall, however, 'Terra Incognita' is a majestic and masterful work of progressive rock. Rarely does a profound story, excellent music and superb performances merge into a wholly coherent, astounding, and entertaining work. 'Terra Incognita' is definitely on my short list of progressive rock album of the year. Highly recommended! 'Terra Incognita' is a majestic and masterful work of progressive rock. Rarely does a profound story, excellent music and superb performances merge into a wholly coherent, astounding, and entertaining work. 'Terra Incognita' is definitely on my short list of progressive rock album of the year. For his new fantasy series, "Terra Incognita," bestselling author Kevin J. Anderson created an incredible fantasy universe with sailing ships, sea monsters, a clash of religions, and a love that will reach to the edge of the world. After the sacred city of Ishalem burns to the ground, a holy war breaks out between the world's two major religions. But this is also a time of exploration and discovery. The young sailor Criston Vora (Michael Sadler) feels the call of the sea and signs aboard the Luminara, a sailing ship that will explore beyond the horizon. After listening to Captain Shay (John Payne) tell glorious stories about the wonders of the world, he says goodbye to his wife Adrea (Lana Lane), promising to return home. Meanwhile, Soldan-Shah Omra (James LaBrie) follows the drive for vengeance demanded of his faith and raids 'enemy' villages. He captures Adrea, taking her away with him�while Criston himself survives sea monster attacks and the sinking of the Luminara. The two lovers, swept apart, must cling to their love and try to find each other. Each of the 13 tracks, including two major instrumentals, stand alone; they are snapshots of the epic story, with connective prose written by Anderson.